Android offers a wide range of alarm’s applications for everyone. It contains everything from basic Android alarm clock until curious applications that ensure that we are not going to be late to work. 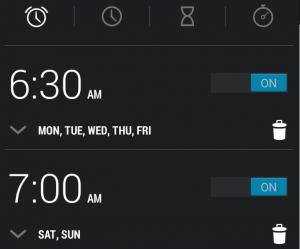 We will detail here how to use the alarm clock that comes with Android by default and also see some of the most interesting applications of alarm clock currently on the market. The default alarm clock that comes with Android is quite complete. We can define multiple alarms and configure them independently selecting the days of the week we want it to be active, its mode of operation, the ringing alarm tone, etc. It also has countdown function from any date and a stopwatch function. Timely. It is one of the most beautiful clock apps that you can find on the Google Play. It doesn’t have many extra features, but it has a very nice interface. Here you will find more information about Timely. Alarm Clock. $1.99. In addition to the traditional alarm clock, it offers much more customization tools, offering times based on sleeping cycles, like sunrise, or it even has the option to nap. The watch has a particularly nice design. Sleep As Android. This application has the particularity that uses the phone’s accelerometer to monitor our sleep patterns, being with us over the pillow overnight. Puzzle Alarm Clock. This app asks us to solve a mathematical operation, input a captcha or play memory cards to stop the alarm. Thus we can’t turn off the phone by mistake. Alarm Clock Xtreme. It has the posibility to set up various alarms independently with different sounds and independent modes of switching it off. If U Can Sleep. This app allows us to introduce a picture of some place in the house acquired with our smartphone. When the alarm sounds, we have to go to the same point of the house and take a picture of the same object or place to stop de alarm.